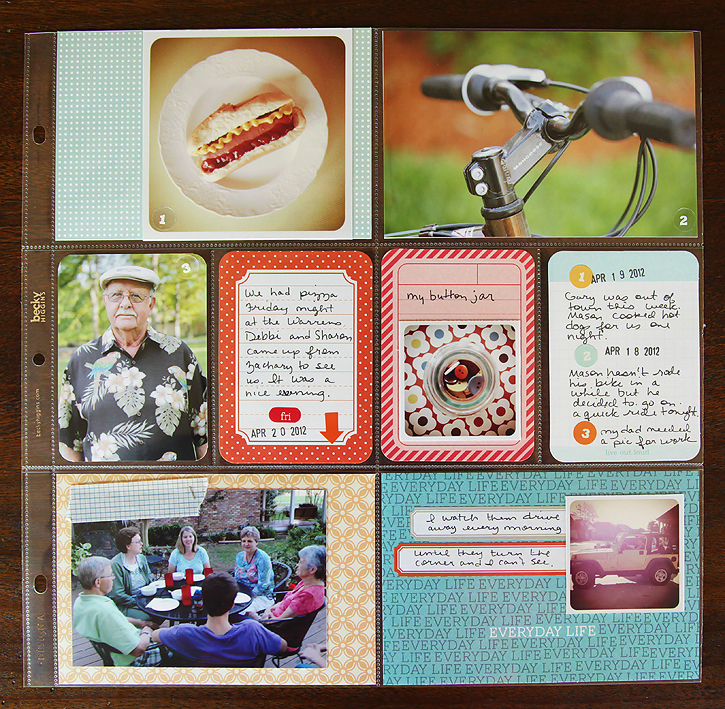 Time to share week 16 of my Project Life. I'm still loving the every day moments that I'm capturing with this album. Too bad I didn't have this when my boys were little. It would be so nice to look back on. This week I took a pic of my weekly trip to Target to get groceries. That's definitely a part of my everyday life so I wanted to be sure and include it at some point. I took a photo of one of the hot dogs Mason made for us for dinner one night. It was nice having the night off! And Gary took a pic for me of a get together with some friends. I really love the photo of my dad. He needed a photo for work so he asked me to take it for him. 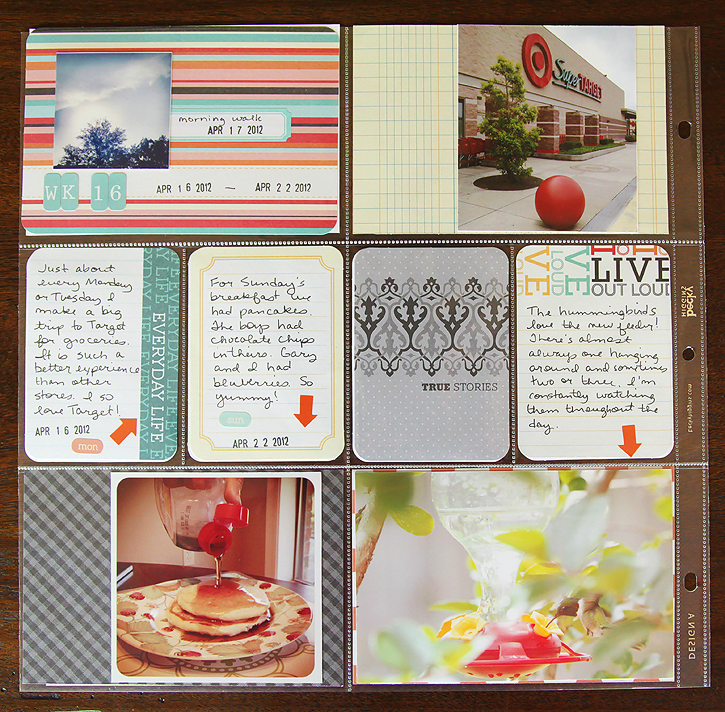 The labels I used in the lower right corner for the journaling are by Martha Stewart and can be purchased at Staples. I had to order mine from their website because we don't have one locally, but I think next time I'll just use some labels that can be printed at home like these that I found on pinterest. My plan is to work on Project Life today. I love putting the pages together so it's going to be a good day! Oh! Love how you doubled up the Martha labels! Also I think the same thing, wish I had been doing Project Life for years. There's so many things before my son was born that would have been awesome to document. 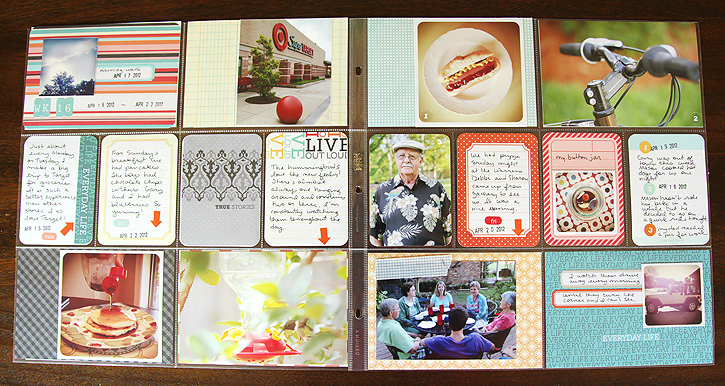 I am in the process of printing all my old photos and getting them into a project life format! First I print my photos. I then lay them out and I flip through the title cards to see if one looks better with the general color of the week's photos and I try not to repeat the same card from the last two or three pages. Then I just randomly select seven cards and the filler card that looks best with the title card. I pick a few plain ones and a few that are more colorful and decorated, but I really don't put a lot of thought into it. Hope that helps! The cards are all so pretty and look so good together I don't think you could mess it up even if you just randomly grabbed any of the cards! Love the look of this week!! I love love love Target and am kinda jealous that you are able to go frequently, ah the city life, there is a Target about 15/20 minutes from me but without a car it's not so close! love the Martha label on that stripey title card - I may just have to try that myself! I love that you took a picture of your Target shopping trip...that's awesome! Love your layouts!! They look great. i have missed visiting your blog. It has been crazy busy around here. Love them.. I worked on some pages today too.. u can see my pages here! So cool the humming birds like the new feeder. We have a patio tree by the pool that blooms red flowers they love so I can always find a couple out there. They are such neat little birds. Wonderful pages this week. Those pancakes inspire me to get cooking. Love the labels you chose too. I love the labels! I love, love, LOVE your handwriting. How wonderful that you are doing this Deb! So cool!